Will allowing more housing types in some single-family zones make Seattle’s whitest neighborhoods more racially diverse? Skepticism abounds, but it may be the best bet for changing deep patterns of segregation. For generations, Seattle was segregated through racist neighborhood covenants, deed restrictions, even banking policies designed to keep certain minorities out of largely white enclaves. Yet nearly 50 years after the landmark Fair Housing Act sought to reverse that legacy, the city remains strikingly separated along color lines. A Seattle Times analysis shows that areas dedicated to single-family houses remain the city’s most exclusive havens. If you live in North Capitol Hill or Sunset Hill/Loyal Heights single-family zones, you have more than 100 white neighbors for every black one. Below are the 10 Seattle neighborhoods with the highest percentage of white residents in their single-family zones, based on 2010 census data. Citywide, one in 14 Seattleites is black. Multifamily zones, where apartments are allowed, are more racially diverse across the city. That’s true for every racial-minority group, The Times found. 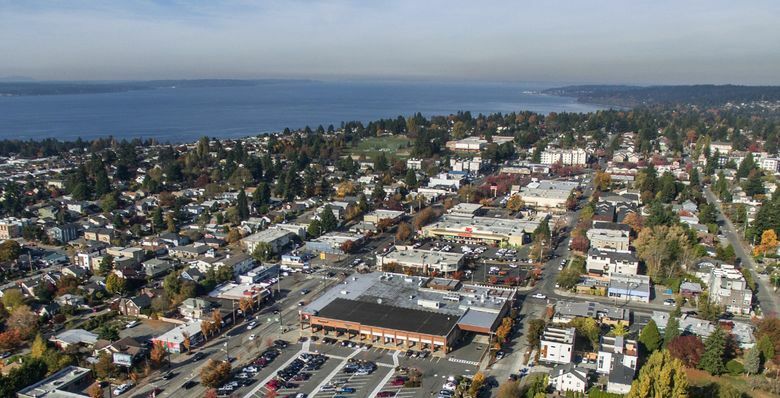 In West Seattle, blacks make up 14 percent of the population in multifamily zoning, but only 4 percent in single-family neighborhoods, according to the analysis of 2010 census data, which feature details not available in more recent estimates by the U.S. Census Bureau. City planners have proposed town houses, duplexes and apartments in some single-family areas, saying they could lower housing costs and bring diversity to these populations. The process of changing 6 percent of Seattle’s single-family zones is before the City Council, part of former Mayor Ed Murray’s “grand bargain” with affordable-housing advocates and developers. The proposal is already getting pushback from neighborhoods. And even some who believe zoning changes are worth a try, such as former King County Executive Ron Sims, doubt their ability to undo decades of discrimination. Whoever is elected mayor Tuesday is unlikely to shift the debate much. Mayoral candidates Jenny Durkan and Cary Moon differ only slightly on the issue. Both call for a more holistic approach. They want to consult communities first, then tailor changes to fit. They want to improve infrastructure in areas absorbing growth. She also called for fighting discrimination (which may be widespread, according to secret-shopper tests by the city) and trying to improve opportunities for minority businesses. Moon supports more townhomes, row homes, duplexes and cottages. “You could look at turning some of the big mansions in some neighborhoods into group housing or rooming housing,” she said in a recent debate. For this analysis, The Seattle Times relied on 2010 census data. The decennial census features “census block” details that indicate where people live, by race and ethnicity, in each city block. Overlaying that data with city zoning maps, we estimated how many people of each race lived in different zones. In cases where blocks were divided into multiple categories, we assigned a portion of the population to each zone. More current estimates of Seattle’s population are available from the U.S. Census Bureau’s American Community Survey (ACS). However, because the ACS does not offer data down to the census block, we could not overlay it with zoning maps. Those are “just one part of the solution,” she said. She also wants to examine, and possibly deter, the role of property speculators in escalating housing prices. Both candidates’ proposals amount to what some call “gentle density.” Would incursions on that scale integrate much? It’s probably too late, Sims said, for much of Seattle’s black population. “People’s feet are speaking loudly,” he said. Blacks have been migrating out of the city in search of affordable housing. And, Sims asks if cottages, townhomes and duplexes would just lead to more white renters in areas bleached by history, economics and discrimination. Crown Hill in Northwest Seattle is one of the leading laboratories for the grand-bargain experiment. In one scenario proposed by the city, Crown Hill faces the greatest encroachment into single-family areas of any of the “urban villages” where the city aims to steer growth. Zoning changes would push into at least five blocks of single-family areas east and west of 15th Avenue Northwest, which bisects Crown Hill. The idea, planners say, is to create more housing types within a 10-minute walk of “very good transit” service. In Crown Hill that’s four bus lines. Two alternatives for expanding the urban village await action by the council, which can edit or scrap the options. Both would more than double its area, which is now mostly a narrow strip along 15th Avenue of boxy retailers, smaller shops and drive-in merchants. One option would change most single-family zoning to allow attached town houses, cottages clustered around a courtyard, and two or three apartments inside single-family homes. 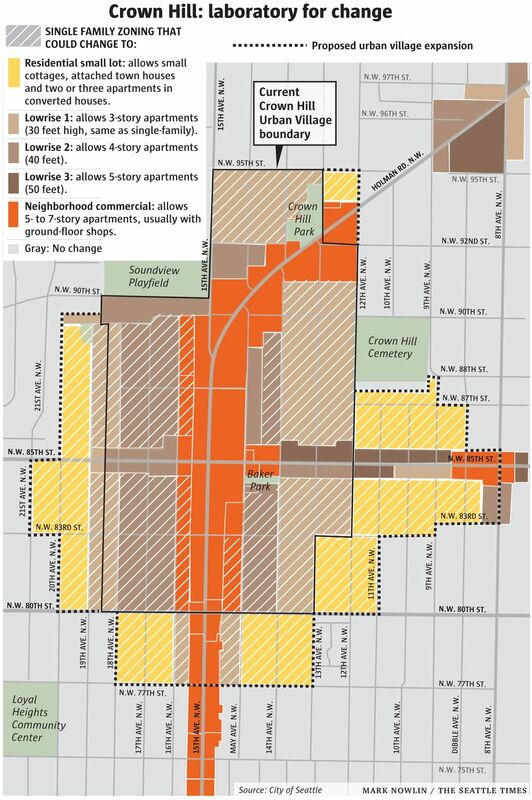 City planners have proposed two scenarios for expanding the Crown Hill Urban Village north of Ballard. This map depicts an option that would change 136 acres of single-family zoning: 5 percent of the 136 acres would allow five- to seven-story apartment buildings; 39 percent would allow attached town houses, small cottages, and two or three apartments in converted single-family homes; 56 percent would allow three- and four-story apartment buildings. The other would permit three- and four-story apartment buildings in most of the single-family area. What’s this got to do with racial diversity? The city found a correlation between new multifamily housing and an increase in low-income residents in neighborhoods, said Jason Kelly, a planning-department spokesman. “We really need additional analysis for race,” Kelly said. It’s coming in an environmental-impact statement (EIS) on zoning changes, he said. Census data show that minorities in Seattle have lower incomes. For whites, median household income was more than $92,000 in 2016. But for African-American households it was $38,000; for Asians and Latinos it was more than $65,000. And the urban-village proposals are tied to a policy that lets developers build taller in exchange for creating affordable housing or contributing to it elsewhere in the city. New buildings could go up seven stories in the existing urban village. That gives reason to think more affordable housing could add economic and racial diversity to Crown Hill. The Crown Hill Committee for Smart Growth wants to slow down. The group argues Crown Hill already has drainage problems, streets without sidewalks and overcrowded buses. Why hurry changes that could add 1,000 housing units? Targeted single-family areas aren’t full of fancy houses, said Ann Selznick, a Crown Hill resident, on a walking tour of streets. Some houses are small and at risk of being torn down for redevelopment, Selznick said, if new zoning increases the value of parcels. Other committee members declined interviews. Selznick said they were not comfortable commenting on diversity, adding that she wasn’t authorized to speak for the group. City Councilmember Rob Johnson said zoning changes should come with investments in schools, drainage and transportation in places like Crown Hill. The council expects to take comments from neighborhoods in the first half of next year, said Johnson, chairman of the council’s land-use committee. He expects a vote next summer on a package of changes to 22 parts of the city. Seattle’s population increased by 130,000 from 1970 to 2015. But about one-third of the city’s land lost population, mostly in single-family zones, according to Dan Bertolet, senior researcher at the Sightline Institute, which advocates for increased density. The decline, in areas including Magnolia, Fauntleroy and Sunset Hill/Loyal Heights, was mainly due to shrinking family and household sizes, Bertolet said. In his view, housing and community assets, such as parks, are going underused. Some of these areas are among the whitest in Seattle. Whether zoning changes would diversify these enclaves is an open question, Bertolet said. “As far as I know there are no comparable examples from other cities that would shed light on the potential effects of Seattle’s proposed changes to single-family zones in mostly white neighborhoods like Crown Hill,” he said. Johnson agreed. While there is no racist intent in the city’s zoning today, Bertolet said, discriminatory patterns remain from almost a century ago, before anti-discrimination laws and the federal 1968 Fair Housing Act were enacted. Minorities gravitated to Southeast Seattle, where restrictions were fewer. We’ve made progress, the city reported this year to the federal Department of Housing and Urban Development (HUD). The proportion of black, Latino and Asian populations had increased in parts of Seattle. But not all of the trends have been positive. In neighborhoods once considered storied African-American areas, the share of the black population has declined, along with black homeownership. Part of the declining segregation the city touted to HUD came from more whites flooding into historically black communities. The Central Area/Squire Park community went from 32 percent white in 1990 to 65 percent white, according to the most recent census estimate in 2015. You can’t mandate a diverse neighborhood, he said. “There is no systemic mechanism that says if you create more multifamily housing you’re going to get more people of color.” And there is no easy way to convince blacks that after decades of exclusion they’d feel welcome on the north side of the ship canal. “I think we forget how important social fabrics and networks are,” Sims said about churches, restaurants and other cultural elements that bind communities of color.